Manuel Gonzalez was born in Mexico, is Managing Director, Head of the Western Region Corporate Clients for Rabobank and founder of FoodBytes! Formerly he was Country head of Rabobank Mexico and holds an MBA from Georgetown University. Caryn Hartglass: Hello, everybody, I’m Caryn Hartglass and thanks for joining me today on It’s All About Food. And today we’re really going to dig deep because it is all about food, and I think we’re going to be learning a lot today. I’m really excited about this program, and I want to bring on my first guest because I know he’s a busy guy, and I want to get right to it, so my guest is Manuel Gonzalez, who was born in Mexico; he’s Managing Director, Head of the Western Region Corporate Clients for Rabobank and founder of FoodBytes. Formerly, he was country head of Rabobank Mexico and holds an MBA from Georgetown University. Welcome to It’s All About Food, Manuel. Manuel Gonzalez: Hello, how are you? Caryn Hartglass: I’m well. Well, actually, I’m not well. I’m actually running a slight fever, but I’ll get better. But I’m very passionate about this show, and I wouldn’t miss it for a moment, so I’m here. I have a lot of listeners on this program who are not only passionate about the food they eat, but they really care about the food system and how food gets to our table from all around the world—our food system, food politics, and certainly the investment behind food. So I thought you might begin by letting us know what Rabobank is, their mission, and then telling us about founding FoodBytes. Manuel Gonzalez: Sure. Well, Rabobank is a Dutch bank, and it’s a very old bank—we’re over 100 years old—and it was actually born out of agricultural credit unions in the Netherlands that just grew and grew and became a bank. So we—our roots are with agriculture and farmers; we’re still a cooperative, so we are a private bank—we are not a public bank, and we have no shareholders because we are a cooperative and…. In the Netherlands, it is the largest bank; it’s an old finance bank but has a commanding leadership in financing agriculture and food. And outside of the Netherlands, we only work with food and agriculture, so we do from farmers all the way up to large companies, the whole value chain—that’s our focus with what we do—and our mission is to make food succeed, which sounds a little bit strange, but I guess it’s—it comes from our origins and why we exist and maybe because we are private, we can afford to have that kind of mission. Caryn Hartglass: So the mission is to make food that feeds—I wanted to make sure I heard that properly. Caryn Hartglass: Okay, I like it. Manuel Gonzalez: To make food succeed. Caryn Hartglass: But at the same time, you want to make money doing it. Manuel Gonzalez: Well, you know, if you want to be sustainable, and if you want to be around, certainly, you have to be a bank that makes money. In that sense, we, yeah, we certainly—we do business, and we do it well. We know very well the sectors that we work in, and that’s why we—we’re good at it. Caryn Hartglass: Okay, so that brings us to FoodBytes. I just went to the FoodBytes Brooklyn event. It—last week; it was great. And why don’t you tell me why you founded it and what FoodBytes’s mission is? Manuel Gonzalez: Well, we were looking at—there are many reasons why we started, but—outside of the Netherlands, we’re very focused on the larger food companies, on the larger farmers, and as you know, lately, over the last ten years, a lot of new companies, new ideas, are coming out, and I think more than ever, we see a lot more innovation, things that are more disruptive, and for us being a knowledge bank and being focused on that, we thought, we felt that we needed to know more about it, but also we thought that we needed to help as much as we could the people that were putting all on the line to work on their ideas and to innovate and are risking a lot to make this happen, so we thought maybe we could have an event that could bring together people who were interested in helping them, investing in them, or in partnering with them, and just to bring them in a place where they could talk and network and just find each other. And that’s why we started doing it, because of course we wanted to know about it, we wanted to learn about it, make it part of the knowledge that we have, but in that mission of making food succeed, there are three very distinct things that we do to make that happen, and one is to improve the access to finance and the access to net worth and the access to knowledge to the people that are working in the food and agricultural business. So that was the idea, and you were at the event—it’s very much about networking; it’s very much about the entrepreneur and about their ideas. And they are the stars. There are other events where you have a lot of very interesting people talking—you know, conferences and things like that—but we thought that we needed to start something where the star was the entrepreneur, and that’s why we created FoodBytes. Caryn Hartglass: Well, that’s great, and it’s hard being in the food business; it’s hard starting a food business. There are so many things that people have to consider, and they need as much support as they can get on many, many levels. So thank you for doing that. Now my understanding is for this particular event in Brooklyn, you had maybe over 200 people who wanted to be selected to present, and you only chose ten. Manuel Gonzalez: That is correct. We received 200 applications, and from the very first one—the very first FoodBytes was February of last year, and it was in San Francisco and based there in the West Coast. From the very first moment, we had over 100 applications and this time, 200, and so you can see also that this is growing. It wasn’t easy to choose—it was pretty difficult. There were many very interesting ideas, and I hope we did a good job, but I have to tell you that—I would say two-thirds of them were very, very good, which is encouraging, and it was very interesting and again very hard to choose. Caryn Hartglass: Fresh Temp! There we go, right. Yeah, using, again, technology with thermometers and measuring temperatures. I don’t know how many people are aware—I got my food-handling certification here in New York, and it’s fifteen chapters of intense stuff that can go on in a food-manufacturing facility, and you have to be so careful. So things like this can make food manufacturing safer and easier. So that’s good. My favorite—my personal favorite didn’t win, but that was Sophie’s Vegan Kitchen. This is a company that’s making vegan fish, which some people may say, “You can’t say that.” But what I see for the twenty-first century being disruptive technology is using plant ingredients to make products that people love that used to use animals and make basically the same products, which are environmentally sustainable and less expensive and healthier. Caryn Hartglass: So that’s where my heart is. Now—yeah? Manuel Gonzalez: No, tell me. Caryn Hartglass: No, no, no—you, please! Manuel Gonzalez: Yes, I think there are different tracks, different sectors in food and ag that are coming up. Certainly, protein—alternative protein—and in that I would put not only vegetable- or plant-based protein but also different ways of raising animals. So those two tracks in protein I think are very hot and, but I agree with you—in particular, plant-based protein is growing and is increasing, and I think in general with respect to food what you see is that today the focus is not only on the ingredients and sustainability but also on taste. And I think in the past, that was probably what people were missing. That this has to taste good, right? I mean, people need to like it in order to eat it, and if you really want to make an impact, your food has to taste well because people, you know—we’re going to eat it, and you’re going to taste it, and it has to be good. That certainly is one, and I think with respect to agriculture, what we saw—Arable, which was the company we’re talking about with a…it’s a very interesting piece of hardware that you put in the land and just gives you incredible amounts of data that can help you improve what you’re doing, so those are the things in precision agriculture; big data, which is data management; robotics, which we didn’t have this time, but we had before—all those things are very important. I think in food you’re also going to find convenience as something that is coming up, and it’s improving, and one of the companies that we had in FoodBytes that came from Israel, DouxMatok, which is sugar. I think also protein—very big in food but also sugar. By that I mean ways—keeping the same taste profile of sugar but making it less sugar, so that is very important as an ingredient but also as sugar itself for example. That’s going to be very, very big, and those are the big tracks right now that we see in food, and there’s a lot going on. I think every single aspect of food and agriculture can and will be probably disrupted at some point. Caryn Hartglass: Yes, now, you may know this already, but I’m going to disagree, and I don’t think that the world needs more animal proteins and seafood. I don’t think they’re sustainable, and it’s true that as developing nations become more affluent, they’re going to want to have animal proteins, but I would like to see a major educational force worldwide to steer people away from that because we now have mounds of data showing that increased animal products cause diabetes, heart disease, increased risk of cancer, and yet we’re kind of ignoring that when it comes to global manufacturing of animals. We’re learning at the same time where animal food causes health problems, plant foods strengthen the immune system and our health, and it’s not necessarily one or the other. That’s my issue I would like to see us going away from figuring out how to create more animal protein, and you know if you really do the math—people don’t like factory farming of animals. It doesn’t have good press because it’s horrific; it’s environmentally devastating; it’s horrifically cruel; but when we “humanely” raise animals—and I put humanely in quotes because I, personally, don’t agree with it philosophically—we don’t have the land mass on this planet to feed 7 billion people, going up to 9 billion, animals like we’re eating in this country, in the United States. We just can’t do it unless we confine animals, which I don’t think is a really good direction to go in, so ultimately we’re going to need to eat less animals. That’s how I feel about it. 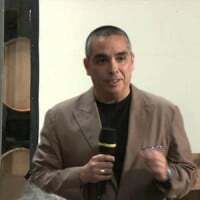 Manuel Gonzalez: Yes, and let me tell you that the biggest impact in animal consumption is going to be when the plant-based protein, it really satisfies the taste of the people. And then it will happen naturally. Caryn Hartglass: I hope so. I really look forward to that. I’ve been doing it for 28 years, and I think it tastes great. Okay, so let’s talk a little bit more about sustainability because one of the companies that was one of the ten featured companies was Love the Wild where they talk about sustainable fish. I think that’s an oxymoron. I don’t think that we can have sustainable fish. Our oceans are depleted already. We can’t take anymore out. We’re doing tremendous damage. We’re just learning about the microorganisms in the oceans that are responsible for the oxygen that we breathe. There’s so little we know about the oceans, and we’re killing them. Manuel Gonzalez: Well, Love the Wild is focusing on aquaculture, so I think they would agree with you and—which is why they want to be 100% aquaculture. That is the point. Caryn Hartglass: Yeah, but aquaculture—aquaculture—where do they get the feed from to feed the fish? I mean most aquaculture today gets smaller fish to feed the fish, or they grow soy to feed the fish. It’s really inefficient. I, personally, from everything I’ve read and studied, I think sustainable fish is an oxymoron. So you heard it from me. There’s probably a business in it now. I just hope we don’t destroy the planet in doing so. And another thing I wanted—I noticed that Rabobank is into a number of priorities, including palm oil. And that’s getting a lot of press, too, because people don’t believe it’s sustainable or that the folks that say they’re making sustainable palm oil really aren’t. What’s going on with palm oil today? Manuel Gonzalez: That’s a hard question for me because that’s something that mostly you will see in regions that are different to the one where I work in, so probably in Asia and South America. I know that in the past, that a lot of things have changed, but I couldn’t give you a good account on what’s going on in palm oil. Caryn Hartglass: Okay, very good. So let’s get back to FoodBytes, the event last week, because I wanted to say there was a lot of great food there, and I really appreciated that there was a menu card on every table. You had to be able to read fine print to see the different dots that let you know whether it was vegetarian, vegan, gluten-free, but I really appreciated having all that labeling. Some of the food was really, really outstanding. Do you know who provided the food? Manuel Gonzalez: Yes, the hall—they prepared everything. Caryn Hartglass: Oh, the space? Manuel Gonzalez: Yes, the venue. Caryn Hartglass: Yeah, they did a great job. And I was really happy to be a recipient of the Gotham Greens at the end of the event, and apparently they had a lot more than attendees, so I took a lot of boxes home with me. But I’m very excited about Gotham Greens as a company. Manuel Gonzalez: They have a beautiful product, and I think they’re going to do really, really well. They’re very passionate, and talking to them is like going to a wine tasting and tasting vegetables, which is amazing. They do a great job. I think they’re a very exciting company. Caryn Hartglass: So they’re in New York City, they’re in Chicago, and they build greenhouses on top of buildings in urban environments. And the food is incredible. And it’s genius. That’s something that I get really, really excited about. I love greens; I think that’s the most important food for us to be eating—leafy green vegetables and any—we should be growing them in every space we possibly can. Manuel Gonzalez: And that’s one of the developments that you see in ag—vertical agriculture, all those things, and precisely doing what you’re saying—producing more food in smaller spaces, a lot of the greens, and also local food that respects where you are. Certainly, that is a big, big development that we’re going to see moving forward more and more and more efficient and better. Caryn Hartglass: Where’s the next FoodBytes, and what can people who are interested in building their companies do about getting involved or seeing if they can get involved? Manuel Gonzalez: The next FoodBytes is San Francisco in June. We’re almost sure it’s going to be June 16, but we’re looking at it—it’s going to depend a little bit on the venue. We want something that is similar to what you saw, that has that kind of space. But most probably it’s going to be that day—June 16. If not, it’s going to be around that date, but it’s mid-June. And then in October we will be in Boulder, Colorado, which is a place that’s innovating quite a bit in food. Caryn Hartglass: That’s great. What about Chicago? Manuel Gonzalez: Well, maybe, maybe next year. We will move around a little bit and find new places. Austin is another great place. And we found that there are a number of places in the US that want to innovate and do new things, so it’s always difficult to decide where to do it. Caryn Hartglass: Well, I was thrilled to be a part of this year’s FoodBytes in Brooklyn, and thanks for joining me on It’s All About Food. Manuel Gonzalez: No, thank you, thank you very much, and best of luck. I hope to see in you in the next one, too. Caryn Hartglass: Okay, very good. Manuel Gonzales of FoodBytes, thank you for joining me. Manuel Gonzalez: Thank you, bye-bye. Caryn Hartglass: Bye-bye. Okay, let’s see. I want to talk a little bit more about the event that I went to. Some of the things that I was really excited about. If you go to my What Vegans Eat – Day 387 post, you can see my report on it and all the food that I ate—because it is all about food. So the most amazing thing that I tried truly was the vegan smoked salmon, and—well, I have to admit, I was never really a fan of smoked salmon back in the day when I was young, and people would put it on bagels, but I tried it, and the flavor was as close to my memory of what smoked salmon was, and I really liked it. Amazing. And I think with a good vegetable vegan cream cheese, a good bagel, I don’t think people would know the difference, frankly. So that’s exciting, and the thing is, you can buy it online if you’re interested in trying it, but I think it comes in like ten packages or something, so you have to buy a lot of it—make sure you’re going to like it. But I thought it was really exciting and another product that I tried by that same company, Sophie’s Kitchen, is their crab cakes. Really fun. They have a number of vegan options—breaded vegan shrimp, vegan crab cake, vegan lobster mac and cheese, vegan seafood jambalaya, and, of course, the salmon and probably some other products. Pretty amazing stuff. Like I was saying before, personally, I don’t think there’s any such thing as sustainable fish, and I think we’re kidding ourselves. From what I’ve read from a number of environmental sources, we have these agencies that certify whether certain companies are sustainable in fish production, and there are environmentalists that are suspect of these certifications, including the Marine Stewardship Council and others. I remember talking to Dr. Richard Oppenlander when he wrote his book Food Choice and Sustainability, and he goes into detail about these fish sustainability labels and how they’re—they can’t be trusted. Of course, when money comes into play, as it always does, these organizations that offer certifications and labeling, they charge a fee. The more companies that want certifications, the more fees they get, so it’s kind of tempting to give more certifications. That is pretty much it for the FoodBytes event. Another thing I wanted to bring up before I go to my next guest is something that—I can’t tell you how excited I am; I’m going to burst. But you may have seen it in yesterday’s New York Times—maybe a couple of days ago in the New York Times, in the business section—called “Trade Group Lobbying for Plant-Based Foods Takes a Seat in Washington.” This is really exciting. Michelle Simon—we had her on the program years ago, and I’m going to have her back at the end of the month to talk exactly about this. She’s a public-health lawyer and food-policy advocate, and she’s founded this new group. It’s starting out with 23 companies, including companies like Tofurky and the new companies that are making protein products from plants. What happens is they are going to now be represented—safety in numbers, strength in numbers—they will be competing against the most powerful lobbies in Washington, and this is a wonderful new beginning. I’m very excited. More on that coming up very soon. Okay, let’s move on, shall we?